Chemical penetration enhancers (CPEs) are frequently incorporated into transdermal delivery systems (TDSs) to improve drug delivery and to reduce the required drug load in formulations. However, the minimum detectable effect of formulation changes to CPE-containing TDSs using in vitro permeation tests (IVPT), a widely used method to characterize permeation of topically applied drug products, remains unclear. 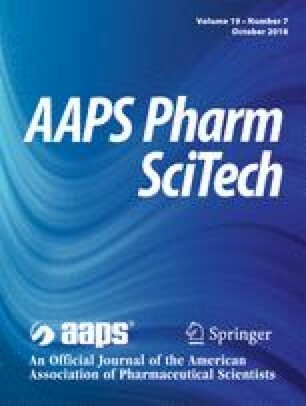 The objective of the current exploratory study was to investigate the sensitivity of IVPT in assessing permeation changes with CPE concentration modifications and subsequently the feasibility of IVPT’s use for support of quality control related to relative CPE concentration variation in a given formulation. A series of drug-in-adhesive (DIA) fentanyl TDSs with different amounts of CPEs were prepared, and IVPT studies utilizing porcine and human skin were performed. Although IVPT could discern TDSs with different amounts of CPE by significant differences in flux profiles, maximum flux (Jmax) values, and total permeation amounts, the magnitudes of the CPE increment needed to see such significant differences were very high (43–300%) indicating that IVPT may have limitations in detecting small changes in CPE amounts in some TDSs. Possible reasons for such limitations include formulation polymer and/or other excipients, type of CPE, variability associated with IVPT, skin type used, and disrupted stratum corneum (SC) barrier effects caused by CPEs. We thank Dr. Nihar Shah for his valuable guidance in TDS formulations. We also thank 3M for providing various samples of release liners and backings, Henkel Corporation and Dow Corning for providing PSAs, and Croda Inc. for providing various chemical penetration enhancer samples. Funding for this project was made possible, in part, by the Food and Drug Administration through grant 5U01FD004275-05 (Subaward NIPTE-U01-MD-2016-003-001). The views expressed in this paper do not reflect the official policies of the Department of Health and Human Services; nor does any mention of trade names, commercial practices, or organization imply endorsement by the United States Government.